This small (to 2cm diam. ), rosette-forming, orange, foliose lichen is easily told by the abundant orange discs with yellow margins. It grows on enriched tree bark and in the angles of twigs and is very common often near areas of intensive farming. It can be separated from Candelaria concolor by its K (Potassium hydroxide) + purple reaction and from fertile Xanthoria candelaria by the absence of powdery fragmentation (soredia). Simms, M. J., (2016). 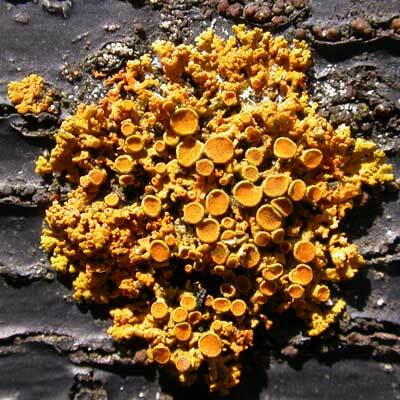 Xanthoria polycarpa (Hoffm.) Th.Fr. ex Rieber. [In] LichenIreland.